I am just going to go ahead and say it. This is THE BEST SPAGHETTI SAUCE I have ever had. My hubby and kiddos agreed. The recipe calls for half a pound of both Italian sausage & ground beef so I froze the other half pound of each and as soon as I tasted it, I was regretting that I didn’t just go ahead and double it. In fact, I am making it again this week and will be sure to double it 😉 This would be a GREAT recipe to make extra and freeze for busy nights! I can already tell this is going to end up being a several times a month meal around here, just like Nana’s Flavorful Fajitas and our Family Favorite Meatloaf. 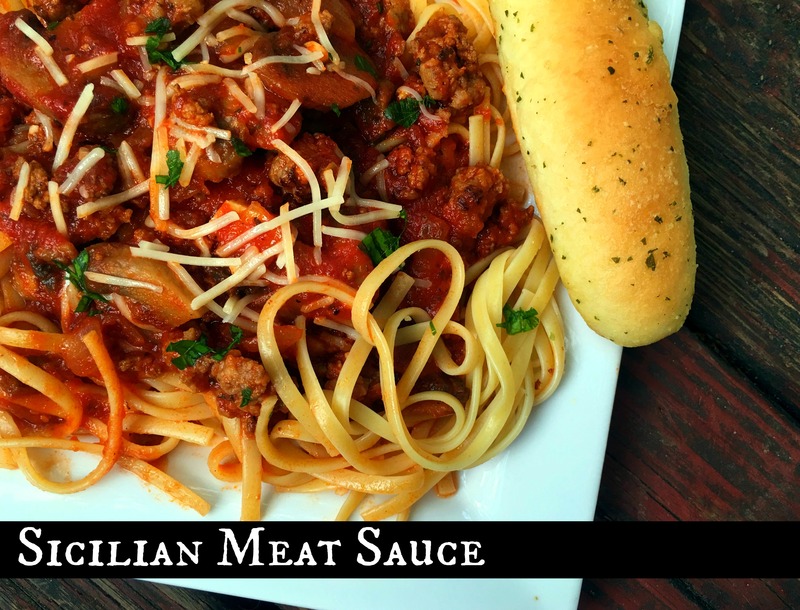 Give it a try and see if it replaces your old favorite spaghetti sauce! In a dutch oven, brown sausage & ground beef. When it starts to crumble, add onions and mushrooms and continue cooking until the meat is done. Add garlic the very last minute, stirring constantly. Drain off excess grease. To the meat mixture add water, tomato sauce, tomato paste, sugar, salt, parsley, basil, & ground red pepper. Simmer on low, uncovered, for 2 hours, stirring occasionally. Taste & adjust seasonings accordingly. Serve over noodles with lots of fresh Parmesan cheese. Enjoy! OMG!!!! This sounds so good. Love all those flavors together. Pinned to my Momma Mia Italian board.